I spent a long weekend in Austin, TX and I LOVED IT. I traveled there to visit my friend Stefanie. Me and Stef go way back — all the way to 2nd grade. There aren’t many memories of elementary school or summers on the lake that don’t involve Stef. We don’t get to see each other often, but when we do, it’s like no time has passed. And this time — we got to chat and catch up over tacos and BBQ and cookies! I arrived late-afternoon on a Friday. Stef picked me up and we headed to Kerbey Lane for dinner. 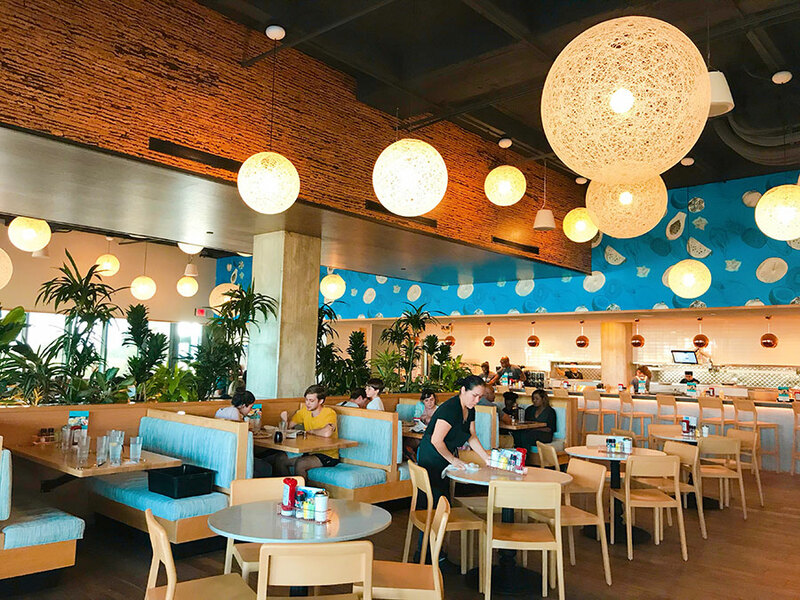 Kerbey Lane is a famous Austin diner-type restaurant — they have locations all over the city. I immediately ordered chips and queso because….when in Rome. For my meal I had chicken + pancakes (a slight twist on the classic chicken + waffles combo). So good! After dinner, Stef dropped me off at my hotel and I crashed. Why are travel days/airports so tiring?! The next day I had bacon and a Texas-shaped waffle for breakfast, then we headed down to Congress Ave. Congress is one of the more well-known streets — filled with shops, restaurants, nightlife, etc. Our first stop was Jo’s for coffee (though I had iced tea) and to see the famous “i love you so much” wall. Then we spent the rest of the morning walking around, shopping, taking photos of cute things, etc. Lunch was at Torchy’s for tacos — so good! Before heading back to Stef’s neighborhood, we stopped at Hayley Cakes and Cookies. I’ve been following the bakery on Instagram for YEARS, so it was a trip to finally be able to visit the store in person. And the cookies were really good (thank you, almond extract!) — I love it when cute cookies actually taste great. I took a little break mid-afternoon to take a nap (because I am an old lady and I was still tired from the day before, I think). We reconvened on Saturday night to go to Stiles Switch BBQ for dinner. OH MA GODDDD, so good! Stef had ribs, I had brisket, and between the two of us, we had mac + cheese, potato salad, french fries, and corn casserole as sides. We did not leave hungry and everything was so delicious. But perhaps my highlight was the fact that they had Diet Dr. Pepper on fountain AND crushed ice. All my dreams came true that night in Austin! After dinner we stopped at Sprinkles for a cupcake because… why not? The next day, Sunday, was another busy day! 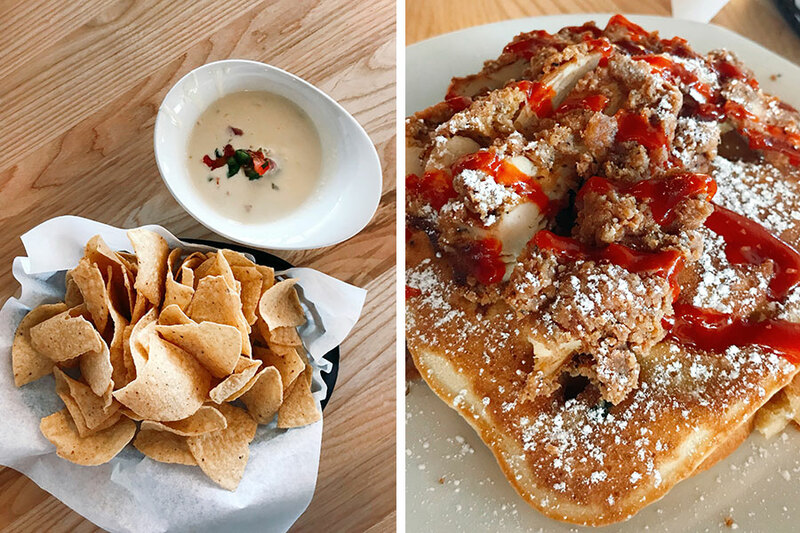 We had brunch at Punch Bowl Social (eating nachos at 9am is dreamy). We visited fancy Target (because I always visit Target wherever I go; stop judging!). We went to a ton of shops at the Domain. Then in the afternoon, we headed downtown to see Ellsworth Kelly’s Austin, which was spectacular. It’s not shock that I love Ellsworth Kelly — but the building and its colored class was so beautiful! The rest of the Blanton Museum was really enjoyable — make sure to visit if you ever get the chance! After our time at the museum, we headed to Casey’s for a snowball. To be 100% honest, I saw the mural on the side of the building when we were driving around on Friday — and because of the mural, I knew I had to stop. I’m drawn to all things rainbow like a moth to a flame! And hey, I really like snowballs, snow cones, and the like. We went to Velvet Taco for dinner, which was my favorite taco experience of the trip. So delicious and everything tasted so fresh and semi-healthy. Loved it! I had a super early flight the next day, so it was an early night for me. I loved my time in Austin and I can’t wait to return someday! Thank you to Stef for showing me around your new city! – We should all love ourselves as much as Texas loves itself. For. Real. – The bathroom situation was amazing. Hear me out. Every single public bathroom that I experienced was its own separate, totally private stall. Texas is doing it right! – Texas loves legal u-turns and hates decent road signage. 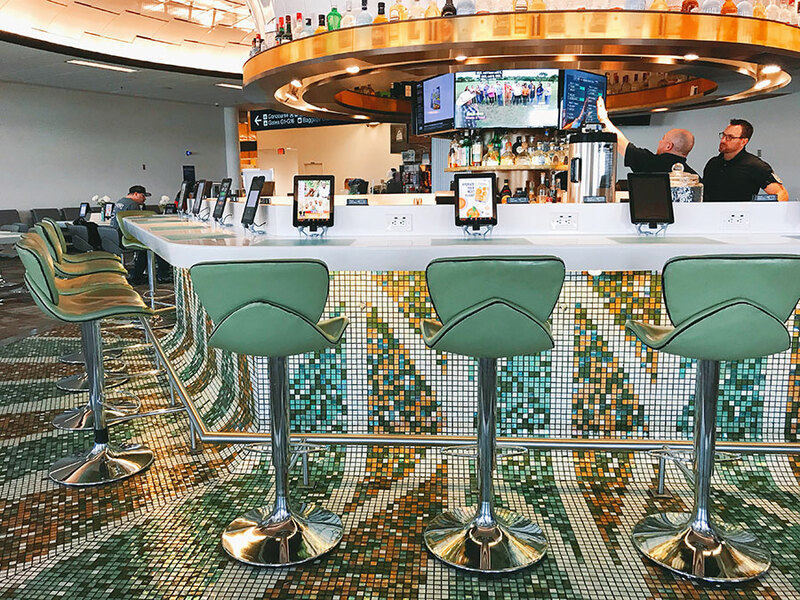 The Minneapolis airport’s “Minnibar” was pretty glam! Of course there’s a cowboy sign above the bed. Of course. i love you, too! The story goes that the “i love you so much” was spray painted by Amy Cook, a local musician, in tribute to her then-girlfriend, Jo’s co-owner Liz Lambert. Romance! The wall of dinosaurs at Maya Star. I could think of worse candidates. The mural game is STRONG in Austin. I bought the cupcake from this “Cupcake ATM” — because I am what I am: a basic white girl. It was chilly, which I wasn’t expecting! Low 40s and windy — but that made for fewer people out and about. It was a win! Jawbreakers. I just liked the colors. Great stairs at Erin Condren; and let them eat cake in the bathroom of Velvet Taco! The prettiest candy store I’ve ever seen. A great green wall. I don’t know why I love walls so much but I do. The Patron Saints of my life: Dorothy, Sophia, Blanche, and Rose. Thank you, Huji app, for making the art museum EXTRA artsy! Always love a good neon sign. Bones hanging from the ceiling. The iPhone pics don’t do it justice. And me… at the airport… at 6am. See ya next time, Texas! My March post is a little late — sorry! I got back from Austin on Monday, so I haven’t had a chance until now to catch up. Speaking of Austin, I’ll do a separate post for those photos. I loved my long weekend there so much! On the whole, March was a better month than February. Real talk: this winter has been hard for me and my mental health. I refuse to be someone who only shows the highlight reel of their life — although I know that most of my photos appear to do just that. But there’s more going on behind the photos! Life is nothing but a series of hills and valleys and I’ve been in a MEGA valley this winter. But I’m working my way out of it — and I know that the warmer weather and increased daylight will help. Something that I try to remind myself of is that growth, whether it be physical, mental, or emotional, is not found in comfort. So maybe this is more of a season of growth than just a depressing valley? Anyway, here are my photos from this month. I’ll be back soon with another post about awesome AUSTIN! Went to see the Ice Castles in Lake Geneva. They were awesome! And so begins the many photos of the love of my life, Sadie. The best thing about March: Girl Scout Cookies! My momma and I went to Chicago for St. Pat’s weekend. St. Patrick’s Day! Brunch with Michelle (totchos!) and some Robbins’ inspired breadsticks! Denny cooked a traditional Irish meal. The new OCC! Looks so different. And then a migraine hit. FML. But Denny brought me a cake — he’s the best. Ardy & Ed’s opening is a sure sign of spring! A group of Tibetan monks came to Oshkosh – how lucky we are to have these cultural and religious experiences. Some March extras! That pretzel was so good. I think February is my least favorite month of the year. It’s deep winter. Valentine’s Day is always depressing. It’s still dark all the time. It’s basically the Tuesday of months. And February 2019 was par for the course. Not a great month for a variety of reasons, but here’s hoping March will be better, brighter, and more fun! Started the month by going to see Cirque du Soleil’s “Crystal” show in Milwaukee. I was surprised at how much I enjoyed it. Scenes of winter. And carbs. My new pencils are awesome. Yet another snowstorm. So I made pot roast! On my last day housesitting for my parents, it was TREAT YO SELF time to Chipotle! Yellow tulips and Cadbury mini egg season! Also, LOL to Gracie’s face. Went to Wendt’s (ha) with Denny. Ventured to Chicago for about 24 hours with Jillian! We went to a tiki bar, which was great fun. Then we went to see Schitt’s Creek: Up Close & Personal! It was GREAT. Highlights: seeing my queen, Catherine O’Hara; hearing Annie Murphy describe her inspiration for Alexis’ absurdity; and listening to Noah Reid serenade us all with an acoustic version of “The Best” by Tina Turner. And wrapped up the month at the UWay celebration event. A mid-month post! I’ve spent the past week housesitting/dogsitting for my parents (who are enjoying sunny, warm Florida) and as a result, my nights have been delightfully free and open. I used the time to do some behind-the-scenes work on my baking blog, which I hope to revive sometime this year. I also cleaned up this blog a little bit. About ten years ago, I wrote a travel bucket list. It’s amazing how many places have been crossed off the list since. I’m a lucky woman to have been able to see as much as I have by the young age of 34. But there’s more to see! I re-wrote my travel bucket list. Now accepting applications for travel buddies! I’m a day early with my January blog post! That rarely happens. Who reads this blog, anyway? I always wonder. In any case, hello to anyone reading (aside from my parents – I know you two always tune in!). January brought my trip to California, which I covered in previous posts. Here’s a roundup of the rest of this month’s photos. Mostly Sadie because a) I’m obsessed and b) what else is there to take photos of in January in Wisconsin? Bleh! I spent NYE at the Y (gettin’ those steps in!) — I’m such a wild child. Sadie and a recently-bathed-due-to-the-pukes Gracie. I deep-cleaned my house and reorganized parts of it. It happens about once a year. It doesn’t always look this “perfect”! I moved my guest bedroom downstairs and my office upstairs cause the upstairs room faces south and gets the most light. My mom and I went to the Dells for a work conference. MEGA STUF OREOS ARE A THING! *hyperventilates* Also, my collection of mugs aesthetically soothes me. Scenes of a snow day. We’ve had record snow + cold temps this month. Sunday Funday. Totchos are my new favorite treat (nachos made with tater tots instead of tortilla chips).